WARNING: Blue Max/Canvas Eagles is a fast paced, easy to learn and highly addictive game. Blue Max/Canvas Eagles is a fast paced multi-player World War I (1914 - 1918) aerial combat game that is played on a hex game mat. Each game depicts a single dogfight in which each player controls a single aircraft, and attempts to shoot down as many enemy planes as possible without being shot down themselves. There is no limit to the number of players that can play in a single game. Blue Max/Canvas Eagles is played on a hex grid game mat, with the players, using an aircrfat maneuver chart decide which maneuver their aircraft will perform on the following move. 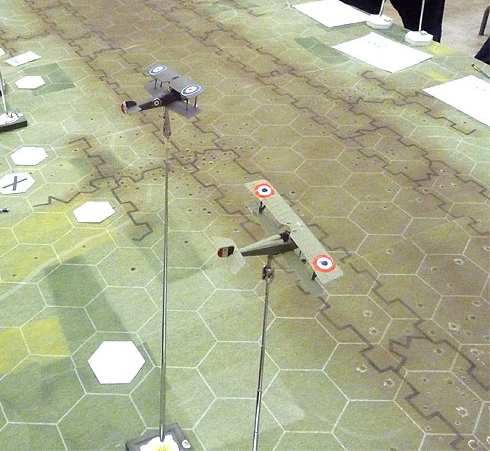 After all players have decided their moves, all the aircraft are moved simultaneously on the game mat. Players can shoot at another plane only if the enemy aircraft is within their fire arc at a maximum distance of 3 hexes. The game rules are very simple with most being contained within the game components used for game play. Referencing the rules manual is rarely necessary. After playing a few games, you can start using the campaign rules, which adds more fun to the game. Want to sell your 1/72nd scale airplane model kit collection, built or unbuilt? We are also looking for Radio Shack/Archer 9-section, 24 inch, antennas/antenna stands (part no.270-1413).